When I first heard about the Mossberg 590 Shockwave shotgun I thought it sounded like a novelty. A fad that would pass on into irrelevance. Sure, it’s short. A taste of the forbidden fruit of an NFA item (though, the Shockwave is not an NFA item nor are short-barreled long guns “forbidden,” but they are hard to get). So, I wondered if it would bring anything new to the defensive shotgun game? After running one I have to say that my opinion has changed. 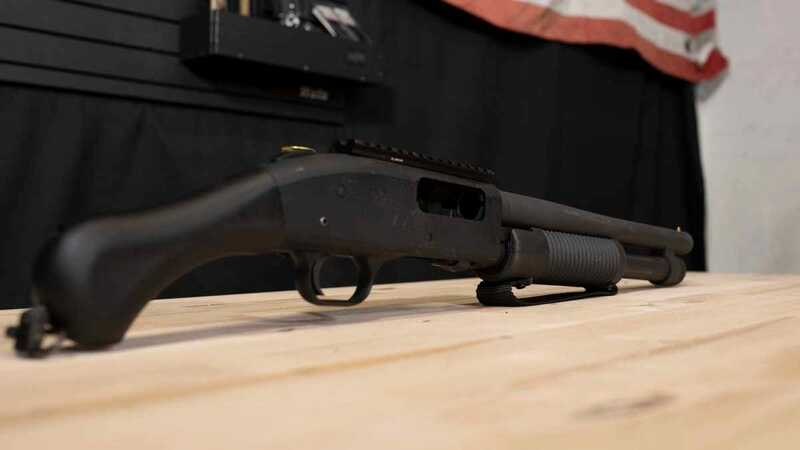 Since many gun buyers aren’t going to invest the time and money needed to buy a short-barreled shotgun, Mossberg eases the pain by offering a non-NFA short gun. Thus, allowing you to scratch that Hollywood “tacti-cool” gun itch. But if you want it for more than the novelty, you’ll need to put in the work. While the Shockwave can deliver the devastating ballistic effect of a shotgun in a small and maneuverable package, this isn’t a firearm for anyone sensitive to recoil. Running the Shockwave requires a firm grip and arm strength. That’s not to say you have to be a gym rat, but it will beat you up on the range. That said, once you get used to it, the Shockwave operates about the same as a full-size shotgun. As far as function and features go the Shockwave is set up just like the rest of the Mossberg 500 series of shotguns. Features include an ambidextrous safety on top of the receiver; dual extractors; twin action bars on the pump handle; an anti-jam shell elevator; a brass-bead front sight; and the magazine tube holds five shells. The most unique feature though is the “Raptor” birds head grip, which tames recoil quite a bit. That was probably the biggest surprise about this gun. While there is still a decent amount of felt recoil, the Shockwave is much easier to control than I expected. And if you load it with low recoil Aguila 1.75-inch Mini Shells, the felt recoil is further reduced to the point of some large caliber handguns. The Mossberg Shockwave shotgun varies in price, ranging from $300-$500 depending on configuration. Also, a host of aftermarket parts and accessories are available for the design.